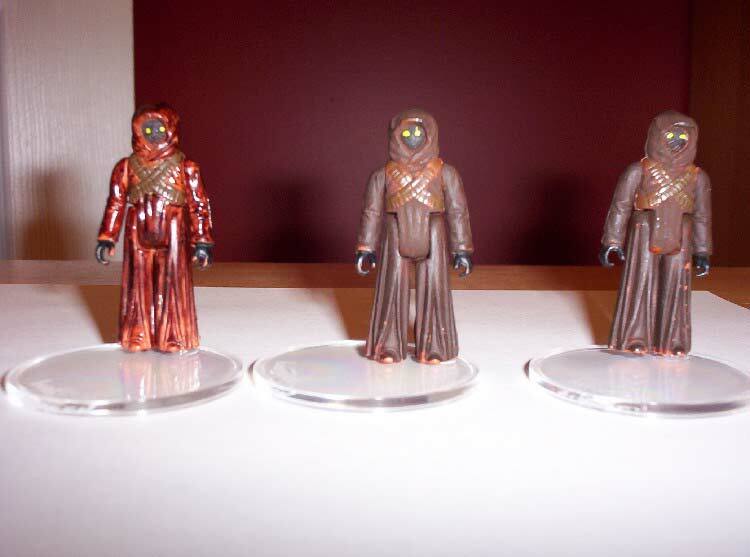 Before switching from a vinyl cape to a more realistic cloth version, an idea was introduced to simply paint the jawa figures with a darker color instead of using a cape for the figure. First a brown marker was used to paint a production jawa with a dark color to test the idea. When finished, two other production jawa figures were painted with liquatex, a water based acrylic based paint to give the figures a darker color. When suggested to Kenner as a way to save money, the idea was rejected. Though the idea had been rejected, the figures serve as an idea that never went forward. These figures are the ones produced for mock-up purposes and give a glimpse of the early days surrounding Star Wars and Kenner.